Compliant software to EC and US legislation. Spin off of the "Institut d'Astronomie et de G�ophysique G. Lema�tre" (UCL - Belgium) was set up in 1995 to provide the most efficient and scientifically based software & services to Industry, Authorities and Consultants in the field of the Atmospheric Environment. ATM-PRO software are based on realistic 3D Atmospheric & Dispersion models which take into account the Terrain Complexity - Topography and Land Use - as required to assess realistically the impacts of Air Pollution. ATM-PRO develops, uses & markets a comprehensive range of environmental packages which are the most efficient tools to perform realistic Environmental Impact Studies, Emergency planning & Risk Assessment. ATM-PRO range consists in PC windows software including the newest and state of the art modeling tools. 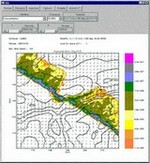 ATM-PRO distributes Lakes Environmental Software Products in Europe.